Here is a brief tutorial on how not to handle an interaction with a patient. First: when a test is delivered to your office on a Monday afternoon, one would think it is well within reason that you would contact that patient (like you said you would) before Friday afternoon. It is rather unacceptable that the patient had to end up calling you to find out what was going on. Secondly: When you talk to the patient and know that you do not have an appointment available until the following week at which time the patient will be discussing the test results with the dr. don’t leave the conversation with “your MRI showed tendonitis and damage”… click. What exactly does “damage” mean? What are the repercussions? How soon can I get a second opinion? Why does my dog keep crawling under the bed? 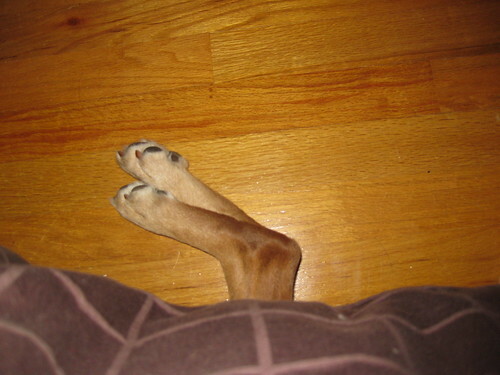 No really… why does my dog keep crawling under the bed? This entry was posted in Uncategorized and tagged Horrible patient relations, I will be sprinting out of that office if the word 'surgery' is uttered, Orthopedist here I come!, SPRINTING!. Bookmark the permalink.